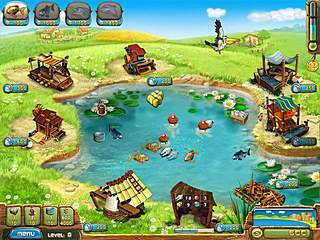 Fisher's Family Farm will take you far from the Christmas routine to a warm nice place for some fishing and a few other things.This new time and business management game has it all very typical and classic within the limits of the genre. You start from Europe and then by looking at the map you know that you are going to visit other parts of the planet. You play as a young woman (for me personally looking just a bit like Holly from The Office, which only makes her more attractive for me)going to visit her parents in a village. Having arrived to their place she finds out that things are not going that well for the parents and their farm. So you decide to help them out together with your pet fish. You get to see the map of all of the places you are going to work at. You start from Europe and then by looking at the map you know that you are going to visit other parts of the planet. You start out with almost nothing - a small pond and pelicans, which are actually dangerous to your fish. 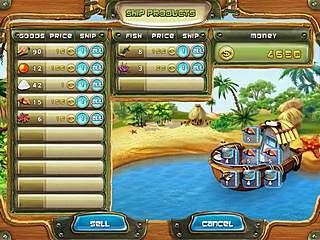 Real soon you get how to sell fish fillet to earn some money and are able to get tracktor now. Tracktor is sent to the field for hey by you while taking care of the fish and selling whatever you caught or produced. Soon things get much better and you are able to get more stations or upgrade the existing ones. Things get pretty hectic as you proceed, and you don't have to go too far to see that. Every level tells you the goal before you start it, and you can keep track of it in the left bottom corner as you play. Your business grows rapidly and it may take some strategy while you do all that to find the fastest way to reach the goal instead of just lots of waisted time on lots of work that could be avoided. Like, for example, you don't want to sell all of the fillet that you get in your storage if the goal is to get a certain number of fillet in the boxes, but rather you want to send right to the station that processes fillet and packages into boxes. Or if you are required to buy a certain fish you want to sell the most expensive items to get as much money as possible as quickly as possible. The game is full of many new items that you unlock as you preceed, which is fun and keeps it fresh. There are also bonuses and trophies that you get for sertain achievements in the game. As to the game's look and sound, they are bright and enjoyable. The fishing theme isn't so used up by other releases, which creates a nice general feeling. 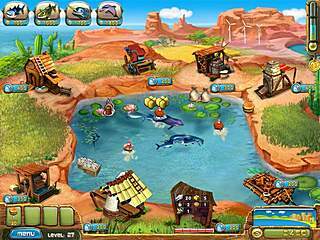 Fisher's Family Farm is a nice time management game full many items to make it an enjoyable experience. This is Fisher's Family Farm for Mac OS review. Download this game here.